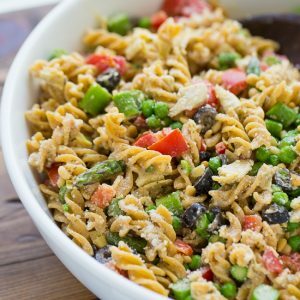 Gluten-Free Italian Pasta Salad – our favorite pasta salad! Loaded with crunchy veggies, cheese, pepperoni and tossed together with a zesty homemade dressing. Always a crowd-pleaser! Summertime is all about the sides and salads if you ask me. 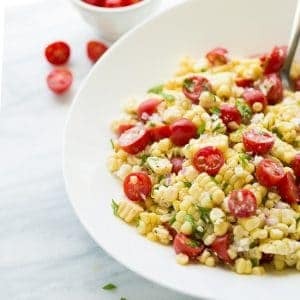 I’m crazy about naturally gluten-free BBQ sides like The Best Homemade Potato Salad or this Summer Corn Tomato and Feta Salad. A summer potluck spread wouldn’t be complete without a delicious bowl of pasta salad. 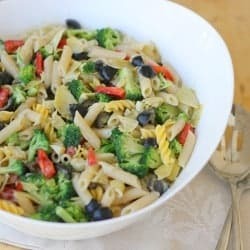 I could eat pasta salad everyday of my life and this Gluten-Free Italian Pasta Salad is my favorite! It has crispy veggies and flavor-packed additions like olives, pepperoni and parmesan. The salad is tossed in a zesty homemade Italian dressing. Making the dressing is really easy – you just shake all the ingredients up together in container. I like using a mason jar fitted with a plastic lid. Homemade dressing also means you know exactly what’s in it and that it’s gluten-free. 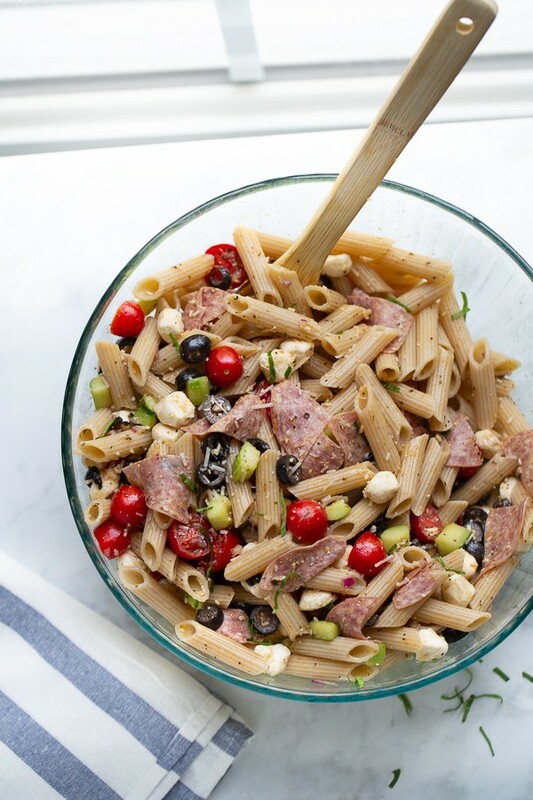 The “secret ingredient” in this pasta salad is a spice mixture that you toss in at the end. 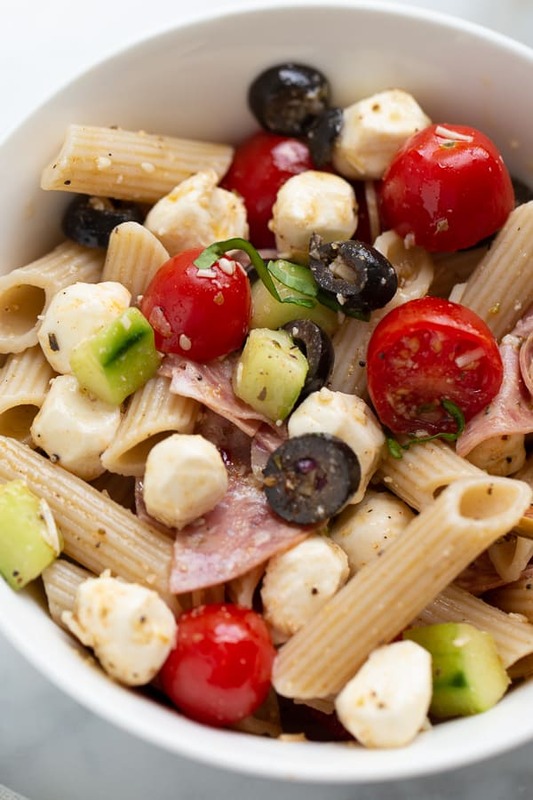 It gives the pasta salad an extra layer of flavor and a gourmet look! It holds up great in cold pasta salad which isn’t the case with other many other gluten-free noodles. Nobody will know it’s gluten-free! We are doing our neighborhood swim team this summer and practice during the week falls during dinner time. So I’m always in search of easy, portable dinners. 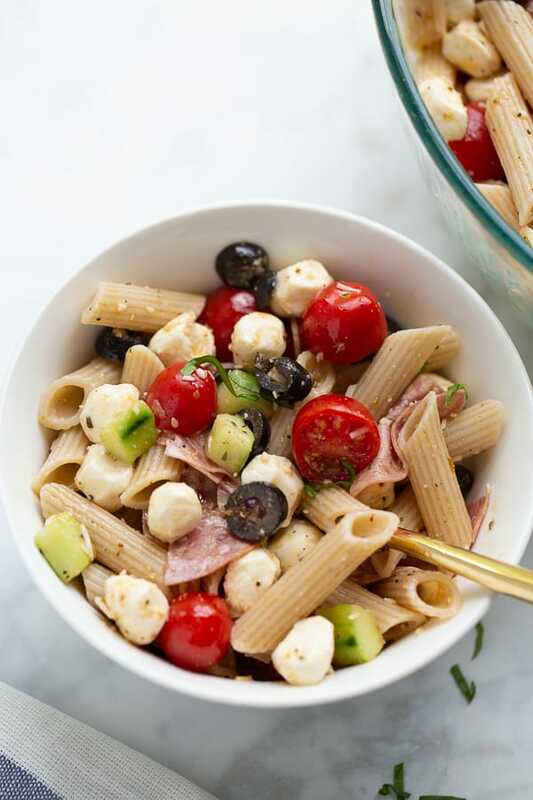 Pasta salad is perfect for on-the-go meals at the pool, beach or wherever else life takes you in the summer. Sometimes I’ll add a can of chickpeas or leftover grilled chicken for added protein. Pasta salad is also one of my favorite things to make ahead and pack for trips. It is satisfying for a meal on its own or delicious as a side at a potluck. 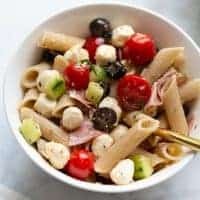 Gluten-Free Italian Pasta Salad - our favorite pasta salad! Loaded with crunchy veggies, cheese, pepperoni and tossed together with a zesty homemade dressing. Always a crowd-pleaser! Mix together the ingredients for the special spice mixture in a small bowl. Mix together the ingredients for the salad dressing in a jar with a lid or whisk together in a bowl. Add the ingredients for the pasta salad to a large bowl. Toss with the dressing and the spice mixture. Enjoy! 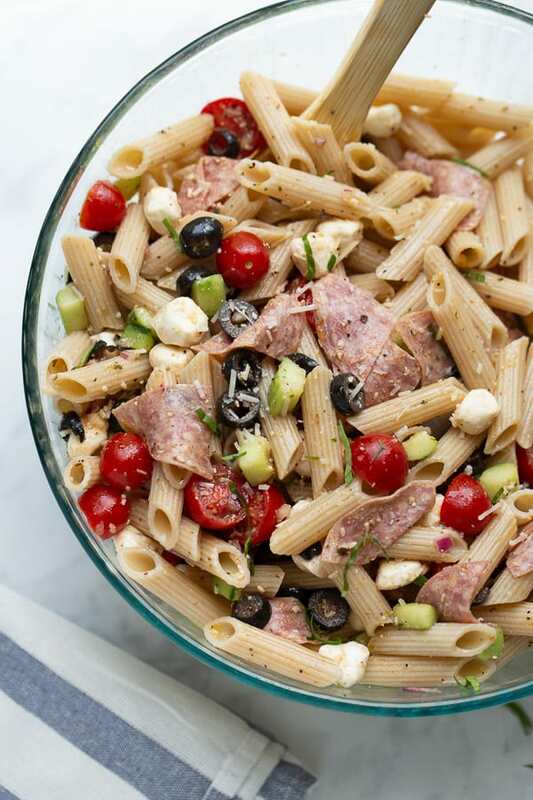 Pasta salad will keep for up to 1 day in the fridge. Literally EVERYONE loved this side. From kids to adults, this will be at all our family gatherings.